Book your online reservation directly with top hotels in Florence Italy - from two star, economy, budget, child & family friendly lodging, first class accommodations to superior hoteles, deluxe luxury hotels and resorts. Find downtown Florence hotels, midtown, business district or airport hotels using our search engine, and find the best hotels in the Florence area for your next family vacation, romantic weekend getaways, holiday, or business trip. A perfect balance between the luxury of a bygone era and modern comforts. 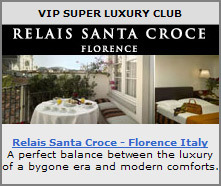 In the historic centre of Florence, an eighteenth century residence hosts the exclusive, refined Relais Santa Croce hotel. Surrounded by its sumptuous furnishings and frescoed ceilings, you will be assisted by highly professional staff and delighted by the evocative nature of this truly extraordinary location in which luxury and refinement are the predominant features. It is the ideal destination for those seeking the intimacy of a private residence in Florence. Hotel Helvetia & Bristol sits right in front of Palazzo Strozzi, a masterpiece of Florentine Renaissance architecture, and just around the corner is the magnificent Duomo with in front of it Giotto’s Campanile, from the top of which visitors can enjoy a truly glorious views over the ancient city. The decor and furniture have been beautifully chosen and the ambiences reflect Florentine aristocracy in its most elegant period. The rooms boast antiques, the halls proudly display their 17th century paintings and the panoramic suites give onto the timeless beauty of the cupola of the Florence Cathedral. Charming three star hotel located in the historical heart of Florence, Hotel La Gioconda is found only a short walk away from the Florence Dome and Santa Maria Novella, and only a few minutes from the posh Via Tornabuoni and Borgo San Lorenzo, so, those who choose to stay in this refined and elegant hotel in Florence, can easily get around the most beautiful and popular vias of the historical center on foot, without the worries of a car. The Hotel, updated with modern comforts and detailed services, welcomes its guests into a sought after historical environment where a typical Florentine atmosphere is united with an exquisite cordiality by the owner and selected staff. This peaceful and luminous hotel offers the most modern and technological services. The Florence Hotel Kraft has been recently renovated with the most modern energy saving techniques making use of energy from renewable sources. Particularities that will make your stay unique are the courtesy and professionalism of our Staff, the location in a residential area in the historical center, making it peaceful, and the swimming pool on the terrace (open from june to september). In the summer months you can sip a drink in total relaxation on the Hotel terrace while enjoying the extraordinary view over the rooftops, bell-towers, and historical palaces not forgetting Brunelleschi's Dome and Giotto's Bell-tower, all surrounded by the green hills of Florence and the Arno River. In choosing Florence, you've chosen to immerse yourself completely in the art and beauty of the Italian Renaissance. That's why the Boscolo 4 Star Hotel Astoria is the ideal choice for your stay. You'll be accommodated in the rooms of the Palazzo Gaddi and Palazzo Arrighetti, historic buildings belonging to noble Florentine families, where art recounts the passage of centuries every step of the way, from the lobby to your room. Indeed, it was while living at Palazzo Gaddi that the great English author John Milton found inspiration for his masterpiece, Paradise Lost, and in these very rooms that he wrote it. The small Inn is a second-class Hotel located between Historical Center of Florence and Cascine Park, the Lungarno River while you can walking and visit Monuments and the Railways station. The Relais continuous the tradition of Inn type friendly hospitality that over the years has been appreciated by many Italian and International travellers. We offer nice and clean rooms to enjoy a charming, typical Inn Accommodation for your lodging in Florence. Rooms can accommodate 1, 2 or 3/4 people, and offer functionality, with a basic but guaranteed level of comfort, including TV. Outside of reception desk opening hours, an automatic terminal allows 24-hour/day purchasing. The rooms have been accurately refurbished, to offer a high standard of comfort and have been equipped with all the modern facilities. Our Relais had the pleasure to accommodate a lot of Italian and foreign guests who made the Inn their second home and meeting point. The Club Hotel is a 3 star hotel located in the heart of Florence , only a few minutes walk from all tourist major attractions such as the Ponte Vecchio , Uffizi Gallery, Michelangelo's David and the Cathedral ( Duomo ). Hotel provides 62 charming and well appointed bedrooms equipped with every modern facilities you expect such, colour TV with satellite channels, direct dial telephone, hairdryer, air conditioning. Amongst the facilities provided for the convenience of guests are: Sightseeing Guided Tours, internet point, porter , Currency Exchange, Laundry Cleaning Service, room service. Villa Stanley is only 20 minutes by car from the historical centre of Florence, easy accessible by the hotel's free shuttle bus or by public transport. The architectural beauty of the fourteenth century building set in a peaceful park, ensures a wonderfully relaxing atmosphere, perfect for either business or leisure visitors. The hotel also offers a swimming pool and tennis court.The La Limonaia di Villa Stanley Restaurant serves excellent Tuscan and Italian cuisine. This, together with professional, knowledgeable service, will make any gala luncheon or informal working lunch a success. Hotel Villa Stanley offers meeting and conference facilities for up to 90 partecipants, and spacious parking. Located in an art nuveau building of early 20th century, in one of the more elegant residential districts, full of shops, restaurants and bars, it is very well connected to Duomo cathedral and central train station by an only 8 minutes bus ride. 3 bus lines running often from 6 a.m. to 1 a.m. Walking distance from Duomo is less than 30 minutes. Only 15 minutes walking away from the other main station of Florence: Campo di Marte. Away from the noisy crowds but close to everything, the area is safe and quiet at night and easily accessible by car. Golden Tulip Mirage Florence is a modern 4 stars hotel with 111 rooms. The hotel is located in the business area of Florence North, 2 minutes from the Airport and 10 minutes from the city centre. The hotel offers fully equipped rooms such as mini bar, wireless or ADSL Internet access, full equipped meeting facilities up to 150 people. All the guest can enjoy the big free parking, the typical 'tuscan' restaurant and the nice piano bar. Hotel Real is situated 5 minutes by car from Firenze Nord highway exit and the Amerigo Vespucci airport in Florence. Buses for the historic center are just 300 meters from the hotel and will take you to the major attractions in no time. The hotel is a modern fully air conditioned building, with two bars, an outdoor swimming pool, an Internet Point and a parking area for about 20 cars. Desiree, eighteen rooms immersed in the quiet of a little family managed hotel in the centre of Florence, about 100 meters form the central railway and near to the most important monuments and museums of the city, the Fortezza da Basso and the Congress Palace. The Hilton Garden Inn Novoli, IT hotel in Florence offers 121 air-conditioned rooms, all furnished in a warm contemporary style, a bar and restaurant facing a spacious portico. A modular meeting room for 150 delegates is equipped with advanced technology. The Hilton Garden Inn Florence, IT hotel offers a 24-hour business centre which is complimentary to guests. Find hotels rooms, hotel booking, hotel deals, Florence hotel reservation, motels, hotels cheap, hotel reservations, Florence hotels deals, hotel offers, booking hotels and more! !